I wonder what the first first lady would think to have a quilt block named for her? 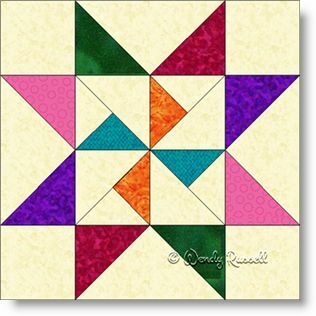 The Martha Washington Star quilt block is a nine patch that could fit into the easy or the intermediate level of difficulty. It would be an intermediate quilt block simply because of the number of pieces required to create the block. This quilt block is a useful one to use as a teaching tool because it contains half square triangles, quarter square triangles as well as flying geese patches -- all of which are commonly used. As illustrated in the sample shown, this quilt block lends itself well to the "scrappy" look. It's a great way to use up all those little pieces you have that you did not know what to do with. Voila! The answer.